13 Laos Tours That Are Totally Worth Taking | Where in the World is Nina? 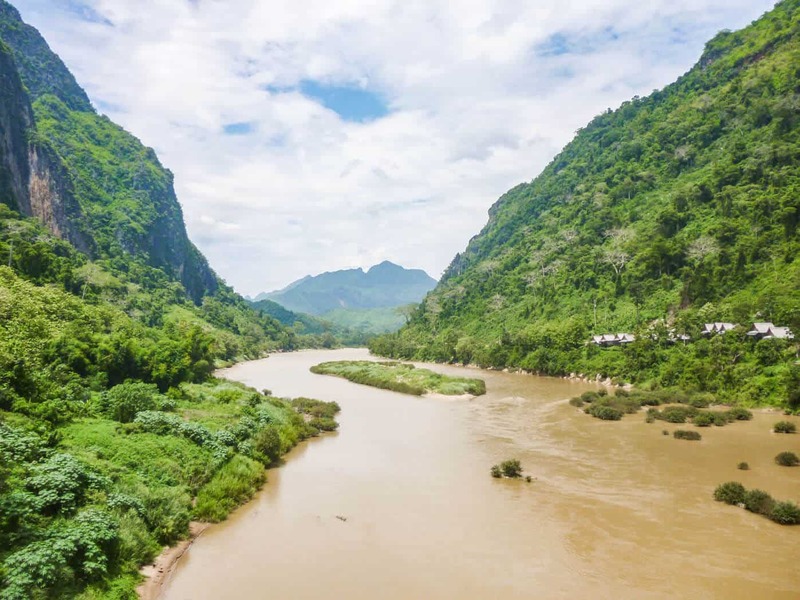 The country of Laos, landlocked on all sides by Thailand, Vietnam, Cambodia and even China, sees millions of visitors every year, and the number is only going up. Laos is certainly no secret anymore but it does get overlooked with its big brothers and sister right next door. You don’t want skip this country while exploring Southeast Asia! There are many reasons why Laos is worth exploring, from its unique culture and tantalizing foods to its incredible natural landscapes—taking one of these Laos tours is a great way to see what this unique country has to offer. → Psst! Here’s entire guide to Laos that you can check out! Complete with a badass itinerary, what to budget, tips, and more. One of the best ways to really get to know a different culture is to understand the food that they cook. Not only will a traditional Lao cooking class provide this, but you will also get to cook and eat your very own dishes while taking in the picturesque scenes of the lakeside pavilions of the restaurant. Start the morning with a visit to a local open-air market and take in rich sights and smells. It is here you will pick your very own fresh ingredients before heading to your cooking station to create some exciting dished like Mok Pa, Laap, and many more. There is no better way to explore the Pak Pu Caves than by boat. 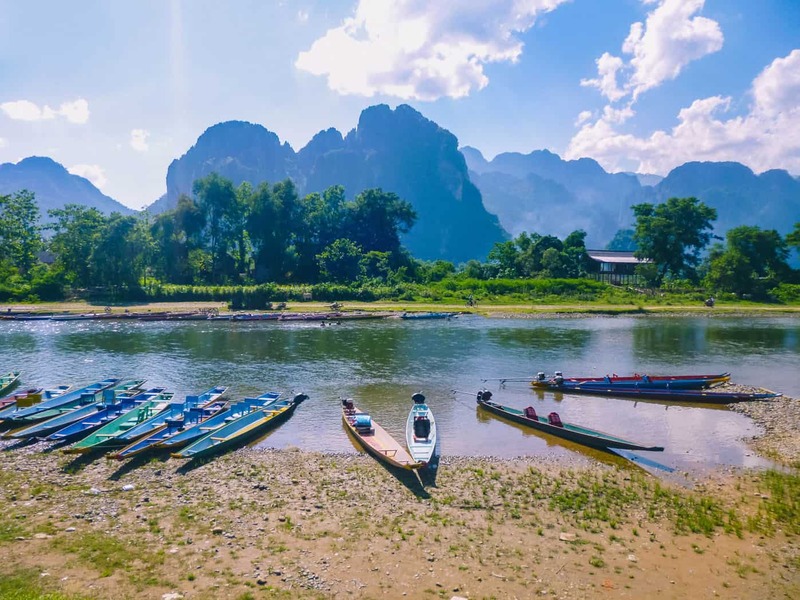 This Laos tour is a cruise down the incredible Mekong river where you will be able to take in the sights of rural riverside life before reaching caves, sitting deep within the impressive limestone cliffs. After exploring the upper and lower caves, you will be treated to lunch at a local restaurant and a visit to the village of Ban Xang Hai, where you can taste some of the local whiskey called lao lao. This city and caves Laos tour is a great way to combine two of the best attractions in the area, and is one of the most popular tours in Laos. The day trip is full and action-packed. You start your adventure with a visit to the stately Wat Xiengthong before embarking on a cruise up the Mekong River to explore the majestic Pak Ou Caves. Other highlights include a visit to the villages of Ban Xanghai and Ban Phanom, the Royal Palace Museum and exploring a range of traditional Wats before watching the sunset on Phousi Hill and wandering the Night Market. Delve into Luang Prabang’s rich culture with this Laos tour, where you can get a glimpse into the daily lives of two of the city’s more prominent ethnic tribes. 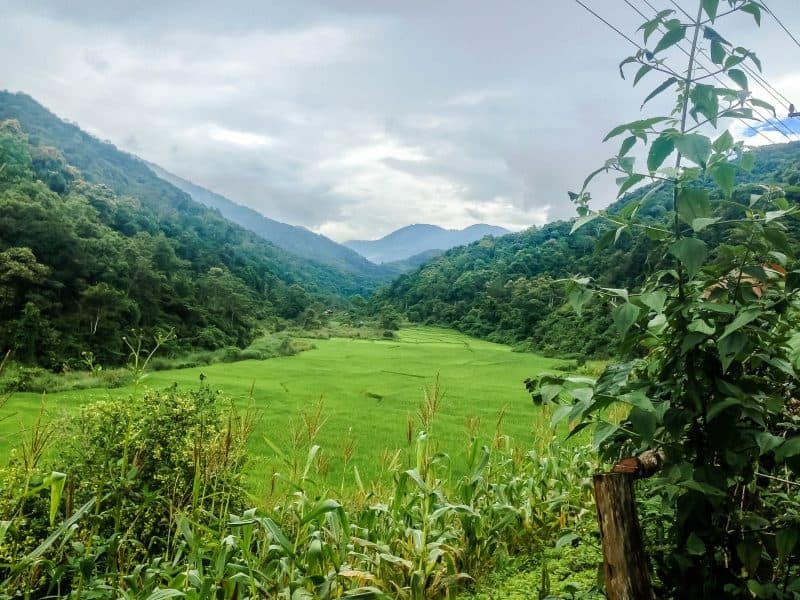 Start with a walk through the paddy fields and forests on your trip up the mountain before exploring the lifestyle of both Khmu and H’mong village. Picture stunning waterfalls and turquoise waters with a backdrop of limestone cliffs on this Laos tour… You’ll be wondering how this place is even real. The Kuang Si waterfall is a stunning place to take a swim, and this tour in Laos allows you to reach it with ease using a shared minibus transfer, taking in the sights of the lush jungle along the way. You can get here without a tour but if you don’t want to deal with finding a taxi and haggling for a price, booking this tour makes everything much easier. 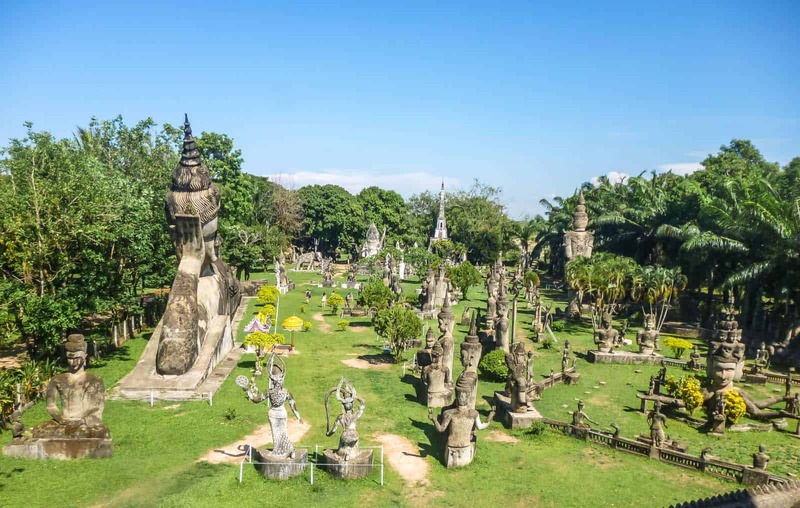 One of the best Laos tours that will allow you to explore Vientiane to its fullest is with a city tour and trip to the Buddha Park. Start your cultural journey with a trip to explore the stunning architecture of Wat Sisaket, Pha That Luang and Patouxai (Laos’ version of the Arc de Triumph) before departing for Buddha Park. The park contains more than 8,000 Buddha statues, a sight that’s beautiful and bizarre all at the same time. There are two options when it comes to exploring the Bolaven Plateau, depending on how much time you have. 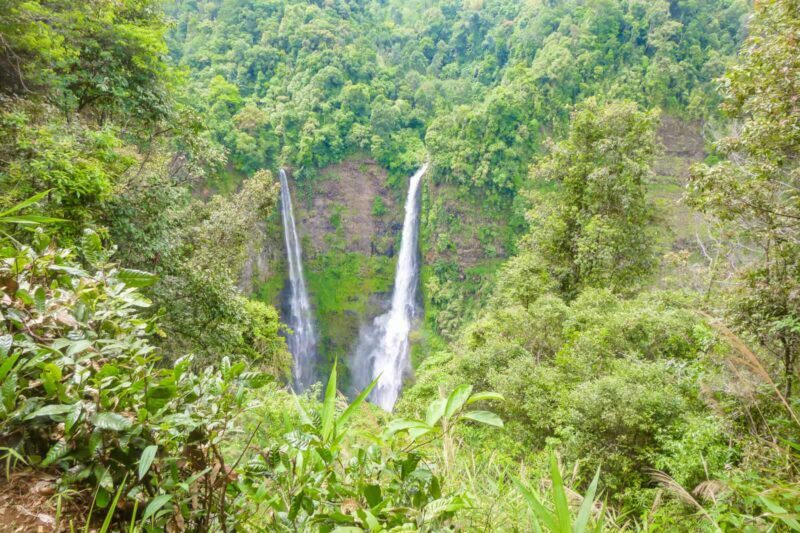 The full day tour allows you to explore the stunning waterfalls in the area, learn about traditional life and customs in local villages and get a deeper understanding of the local agriculture on a Laos tour of the tea and coffee plantations. More amazing waterfalls to visit. For an even more thorough tour, the two-day option also includes the once in a lifetime chance to stay overnight in a local community and join in the traditional Baci ceremony. Explore nature to its fullest with this trip. On this half-day Laos tour, take in the impressive stone formations in three local caves, including the revered ‘elephant head’ stalagmite. The adventure continues with a tubing experience in the Tham Nam Cave before tucking into some local cuisine served traditionally on a banana leaf! Rich in culture, the stop at Hmong village will allow you to chat with locals and take in the surrounding rice fields and mountains. There is the option to also include a trip to a mulberry farm on this tour in Laos which you will learn is a popular thing on the menu in this area. For a day full of adventure, kayak along the famous Nam Song River and go on an exciting zip line adventure on this adrenaline-fuelled Laos tour. The river is gorgeous, kayak to experience even more of the beauty. This tour in Laos offers a great way to see the spectacular mountain scenery, rice fields, bustling villages and enjoy a tasty picnic lunch. If you love heights and adventure, then this rock climbing Laos tour is for you. Learn the necessary safety measures, practice different climbing techniques and feel safe in the hands of knowledgeable instructors before heading to your climbing spot by the river, surrounded by lush forests and incredible scenery. Choose between a half or full day course and get an incredible day of climbing and sightseeing in one. This is one of the best places in Southeast to go rock climbing! 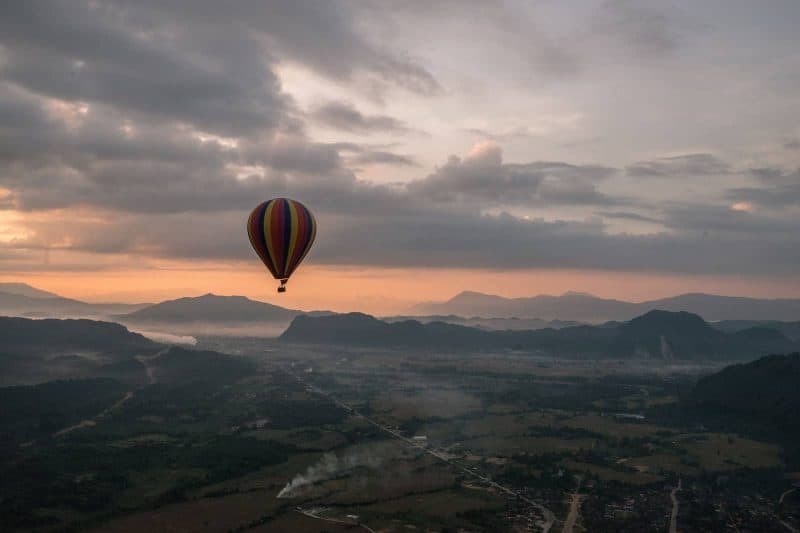 For stunning views combined with a truly unique experience, take a hot air balloon ride over the scenic vistas of Vang Vieng. 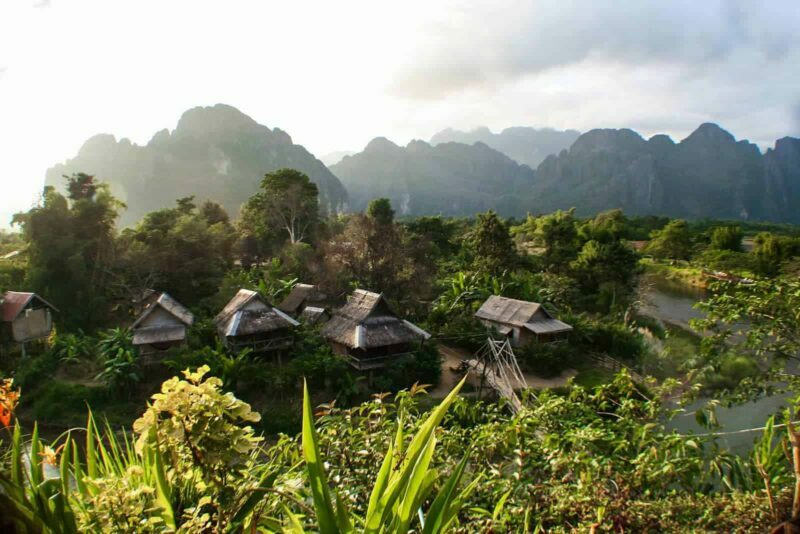 You will reach heights of around 800 meters and get a bird’s eye view of Vang Vieng town, rivers and mountains either at sunrise or sunset. 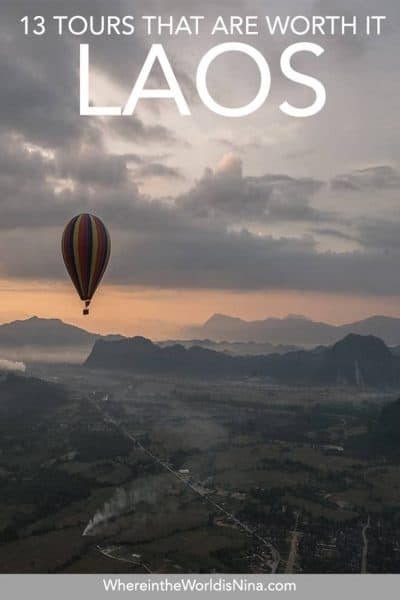 It is not surprising that this is one of the most popular tours in Laos, not to mention the cheapest place in the world to go hot air ballooning! 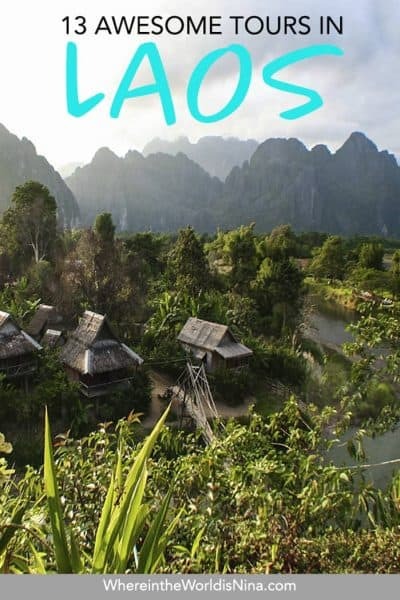 For a day full of adventures, this caving Laos tour in Vang Vieng gives you the opportunity to both visit some popular landmarks while also taking part in some thrilling adventures. Head to Tham Xang, a cave known in the area for its elephant crafted from a stalagmite, before heading to Tham Nam for tubing in its cool waters. After lunch, your activities depend on your chosen tour, from taking a dip in the Blue Lagoon to getting to know the locals at Khmu village, this tour in Laos has it all. Hiking in Luang Namtha is one of the ‘must-do tours in Laos.’ This town is often overlooked but it’s certainly deserving of more attention. Trek through rich jungle and dense forest, witness rice paddies, river banks and farmlands and visit the Lanten and Khmu people in remote villages that can only be reached by foot. Laos is simply incredible and I long to visit again and again. Traveling through Laos and need more info? Check out tons of helpful posts just below! Where will you go after Laos? 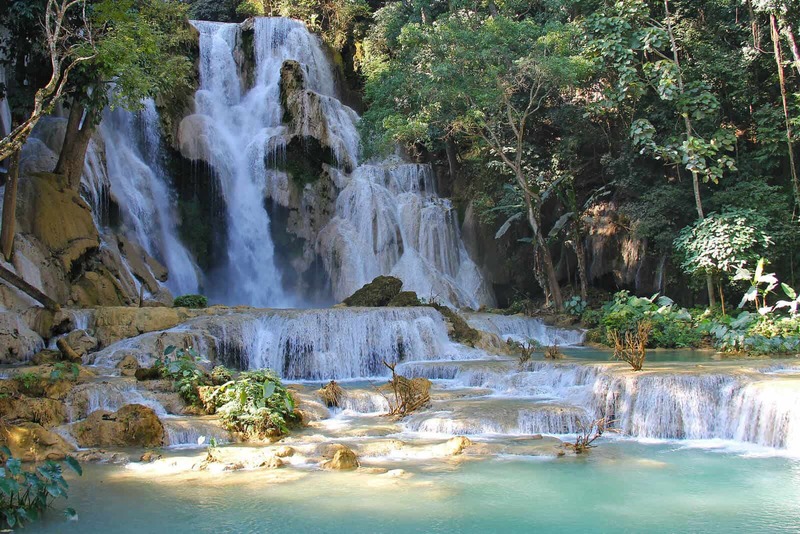 Which of these Laos tours is calling your name? Let us know in the comments!